← Character Contest 61: Aries! 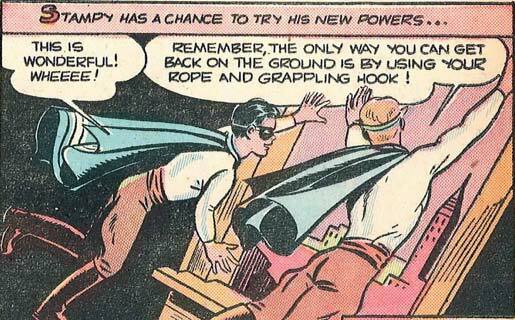 So he can fly up but has to take a grapling hook and rope down? Holy retarded super powers batman! looks like they are both a little light in the loafers! Yeah, apparently “Air Male” gets his power by injecting himself with a serum that makes him “lighter than air”, but the drawback is he supposedly can’t land without being pulled down. So, so lame. Of course, in classic Golden Age tradition, the writers proceed to completely ignore that just two pages later. The title fits. I almost did a face palm when I read that. Floating over a pink city and begging passerbys to pull you down: Priceless. Jack boots and breeches? Who’s side are they on? Well, I guess the comic would have been pretty short-lived if they stuck with that limitation. Page 7: Stampy misses his throw with the grappling hook, and rises higher and higher as Air Male looks on in helpless horror. Page 8 (a splash page): POP! I thought that Air Male was the lamest superhero name since The Whizzer, until I tried to figure out what else he could call himself. Zeppelin Guy? The Floater? Naaaah…Those two clowns should just turn in their towels–I mean capes. Is it just, me or do these two look like two kids playing Superman. I’m ready for Stampy’s Mother to come in and yell @ them for running in the house!